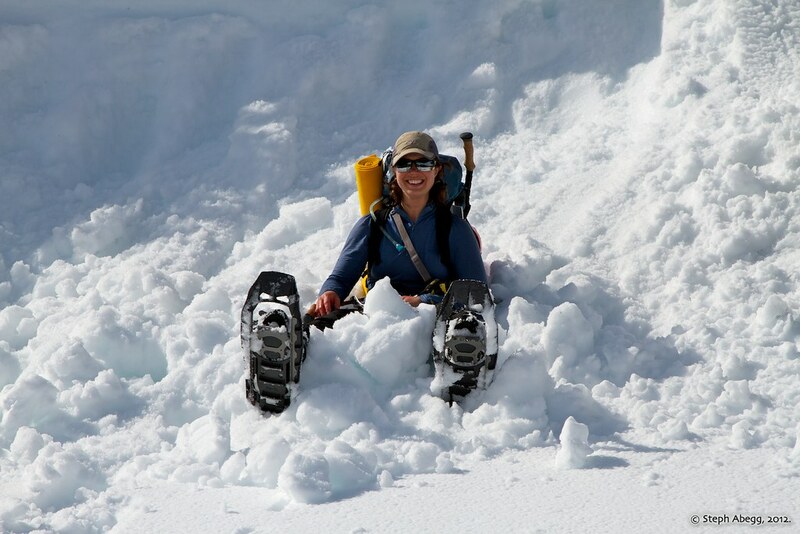 Even if conditions don't allow you to safely make the planned summit objective, it can still be a fun day! 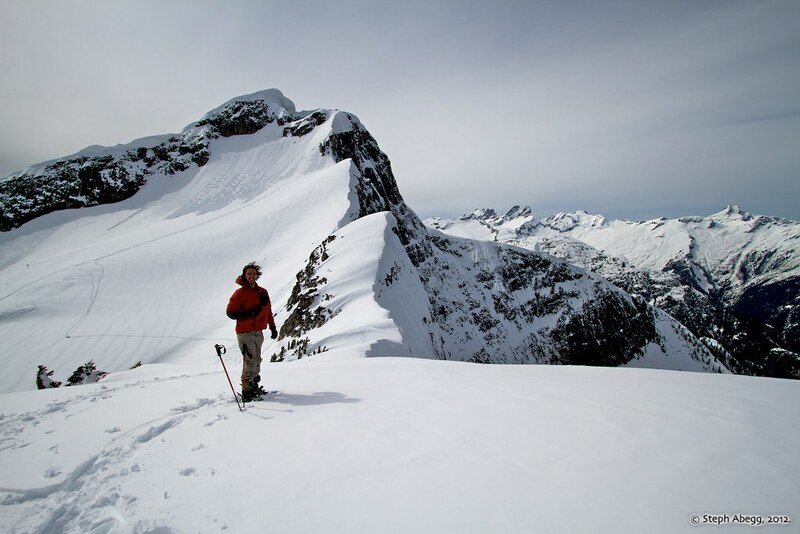 Davis Peak might very well be the most oft viewed summit of the North Cascades National Park. Each year, hundreds — if not thousands — of tourists driving along the North Cascades Highway stop at the Diablo Overlook to gawk at the vista. Yet, ironically, perhaps because of the sparkling blue distraction of Diablo Lake below, few know or remember the name of this peak towering at the other end of the lake. 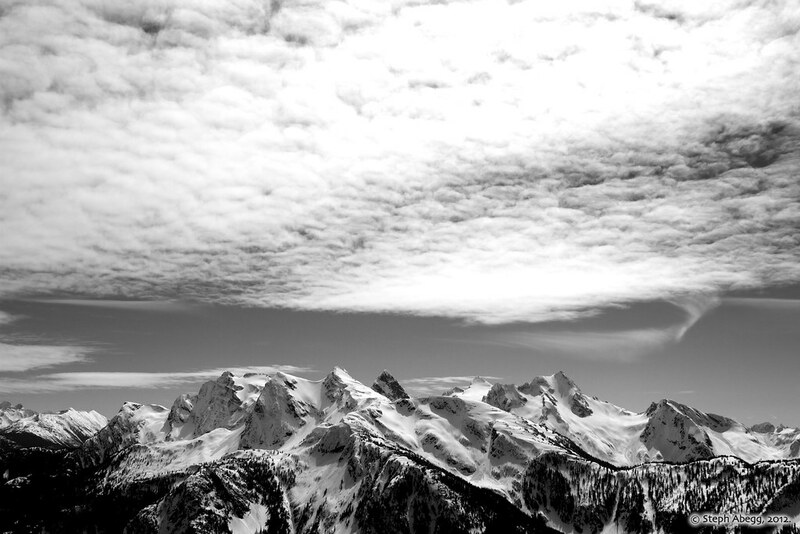 Davis Peak is located just south of the Picket Range in North Cascades National Park. 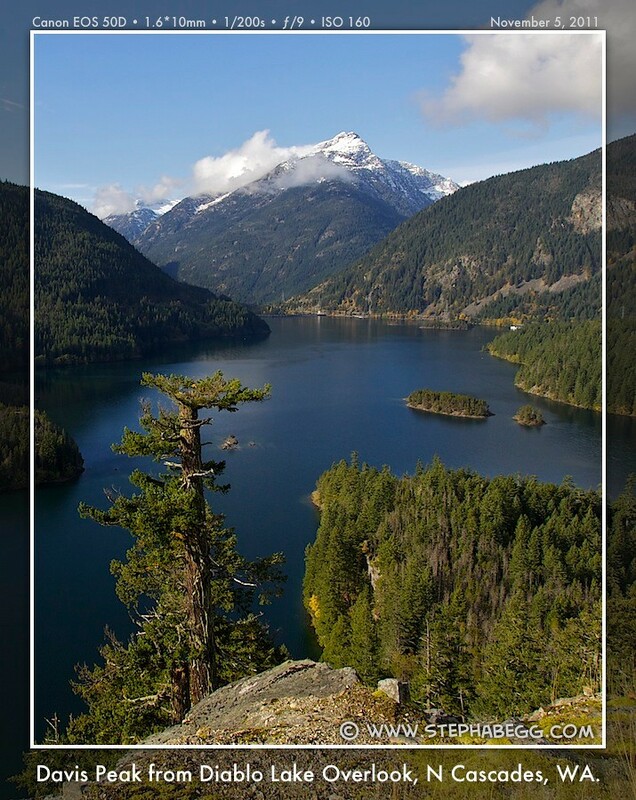 While not of particularly high elevation, it is notable for its large, steep local relief, and in particular for its huge Northeast Face, the only place in Washington State where the terrain drops more than a vertical mile in less than one horizontal mile. 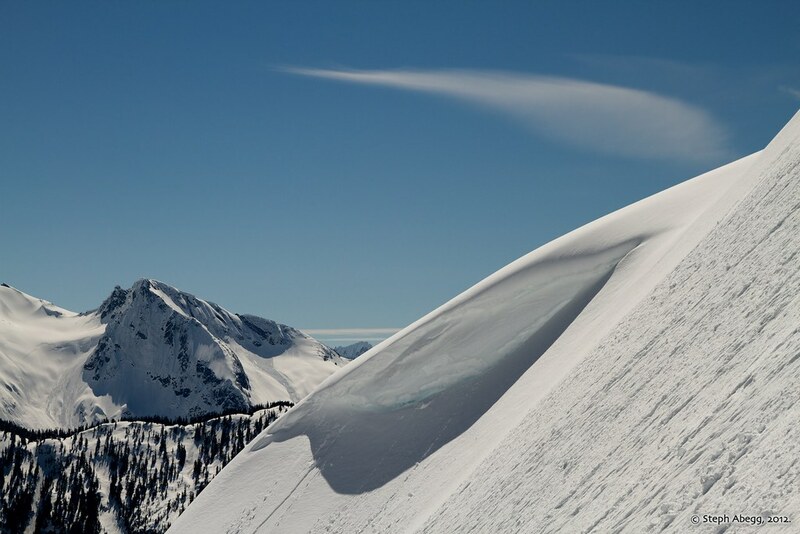 According to Wikipedia, this is one of the two largest vertical drops in one horizontal mile in the contiguous United States, the other being the North Face of Kinnerly Peak in Montana. 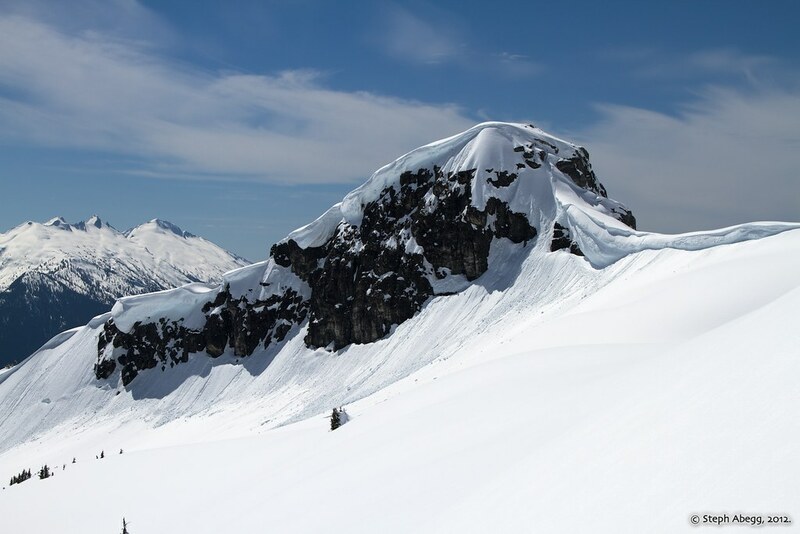 The peak is seldom climbed because of the very rugged approach and rocky flanks. Davis Peak had been known as Stetattle Peak until the Reaburn climbing party of 1904 renamed it in honor of the early homesteading family of Lucinda Davis. The Davis family had built and ran a roadhouse for trappers, miners and other travelers at the base of the peak, near present day Diablo, prior to the arrival of roads or rail, circa 1900. 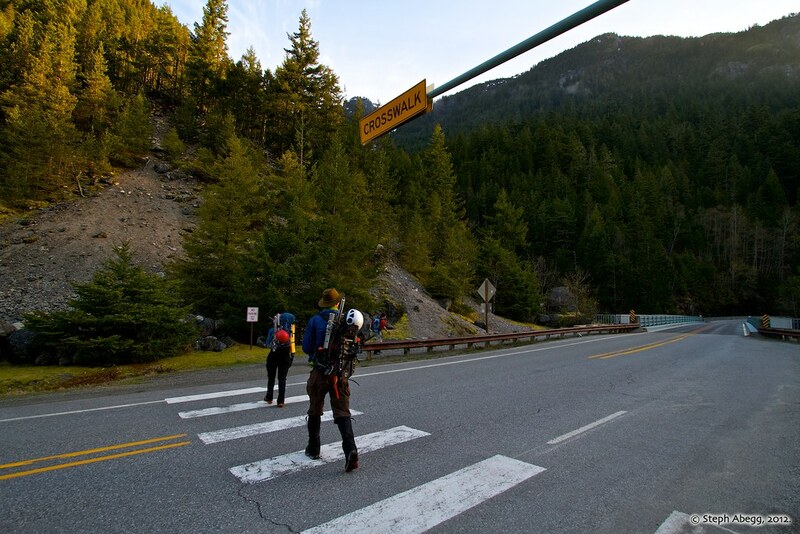 Drive the North Cascades Highway (SR20) to the bridge over Gorge Creek, about 2.6 miles E of Newhalem, or about the same distance W of the turnoff to the town of Diablo. The bridge has open steel grating and there is a waterfall to the N side of the bridge and the gorge below. There are parking lots at each end of the bridge. Elevation here is about 1,100 feet. It was one of the warmest and sunniest days of the spring yet, and by 10 am when we started to break out of the trees, the snow was already becoming quite slushy. 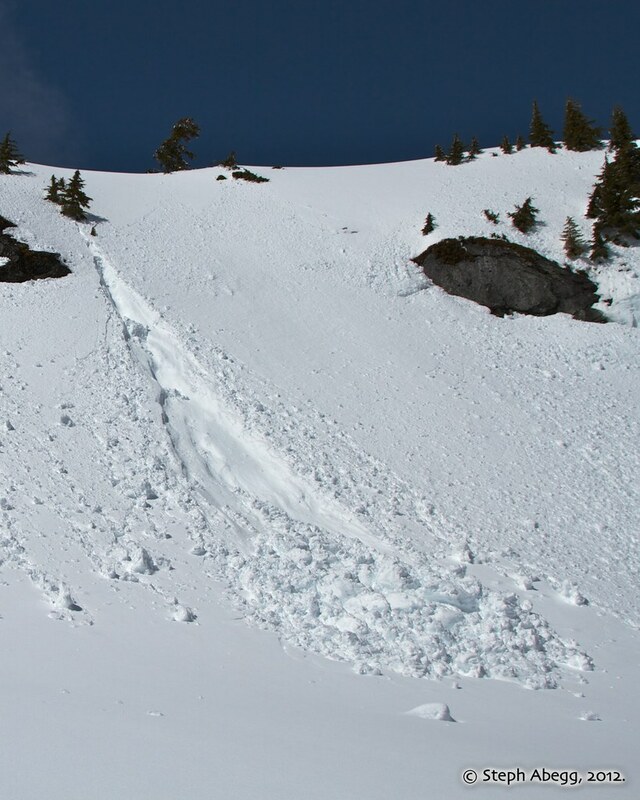 The NWAC avalanche forecast had noted a potential for considerable slide danger on southeast to southwest slopes, which were the aspect of many of the slopes on this route. 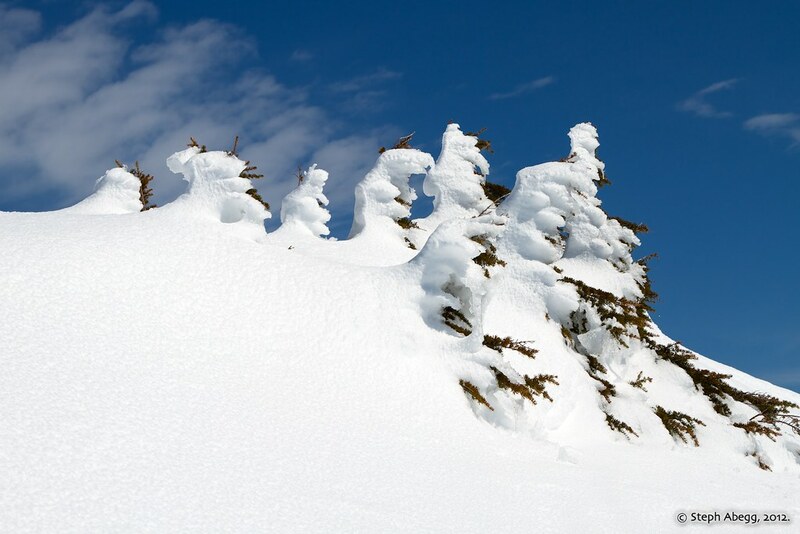 Hence, we we stuck to the ridge, forgoing easy snow slopes for more tedious weaving in and out of outcrops and trees. 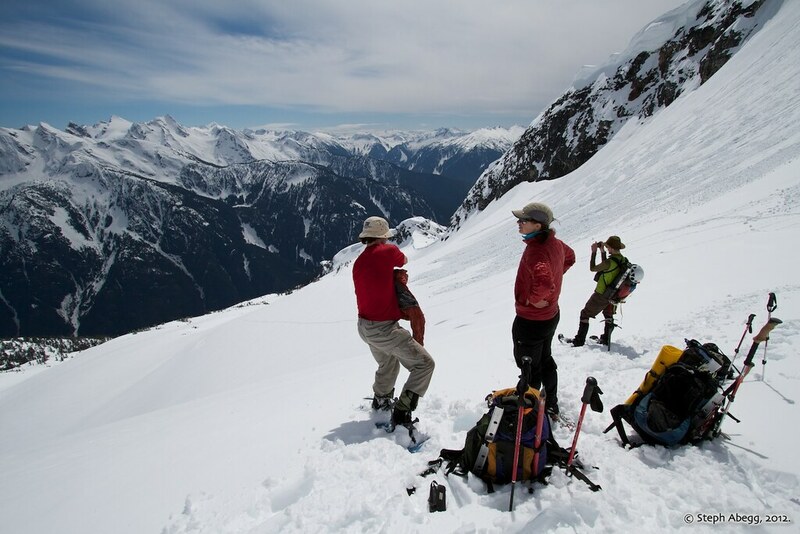 We arrived at Point 5872 overlooking the final summit block, feeling that we had maintained a safe route up until this point. However, what we saw was not encouraging. 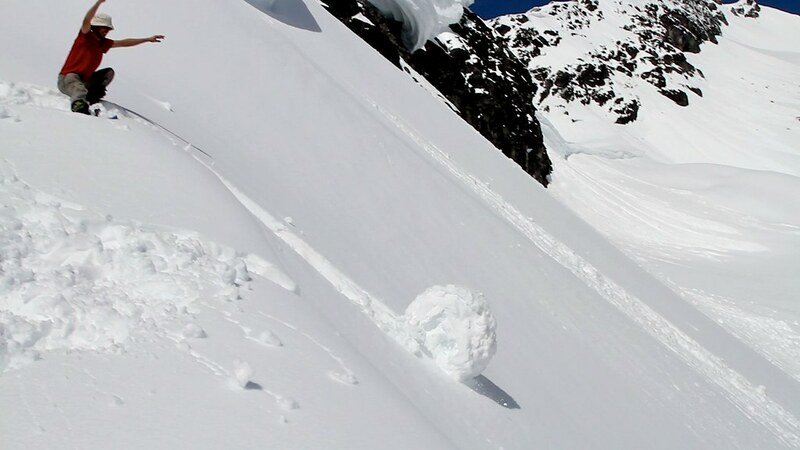 Like a melting ice cream cone, snow was dribbling off the rock-snow ramps we would need to take to get to the summit. 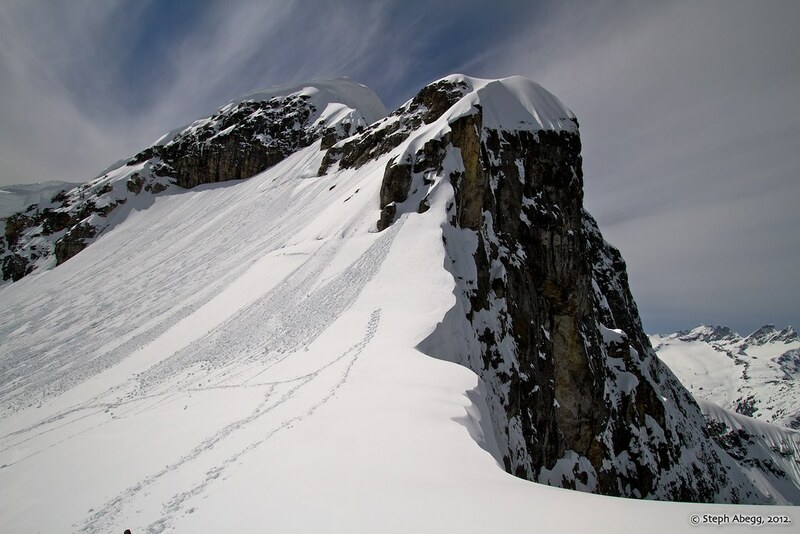 These ramps are tricky enough in good conditions (we had brought a rope and pickets to protect this section), so much as we all wanted to get to the summit, continuing onward just didn't look like a good idea. But it was too nice of a day to just turn around and dive back into the trees. 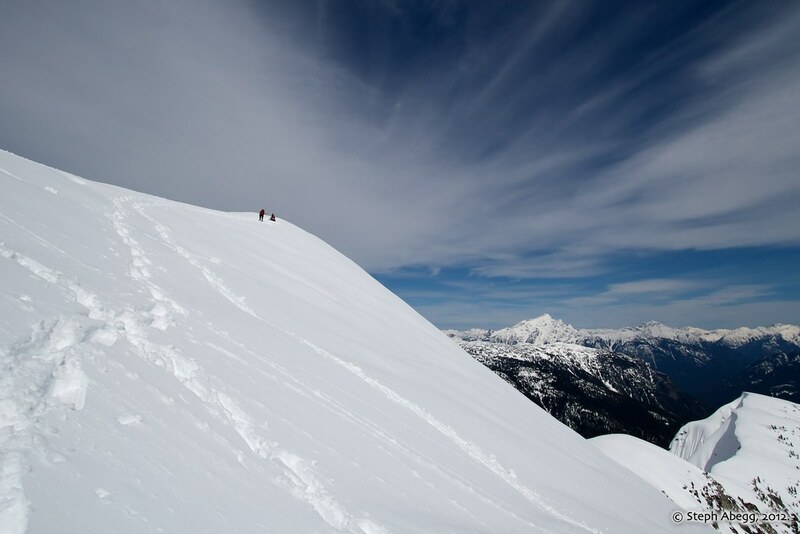 We assessed the terrain, and felt that if we could get down onto the gentle slopes below the east side of Davis, we would be able to make a safe traverse up to the ridge just east of Davis, where we could achieve some great views. 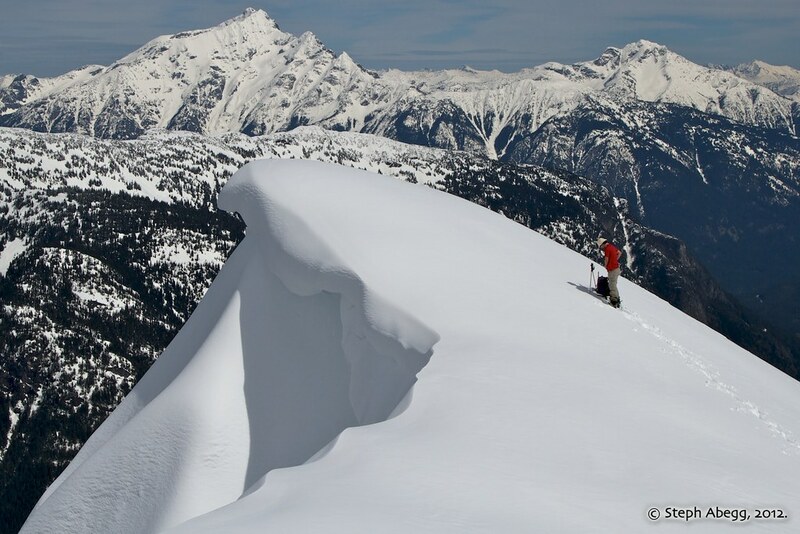 After a bit of searching, we spotted a break in the cornices where we could drop down onto the gentle east-side slopes. 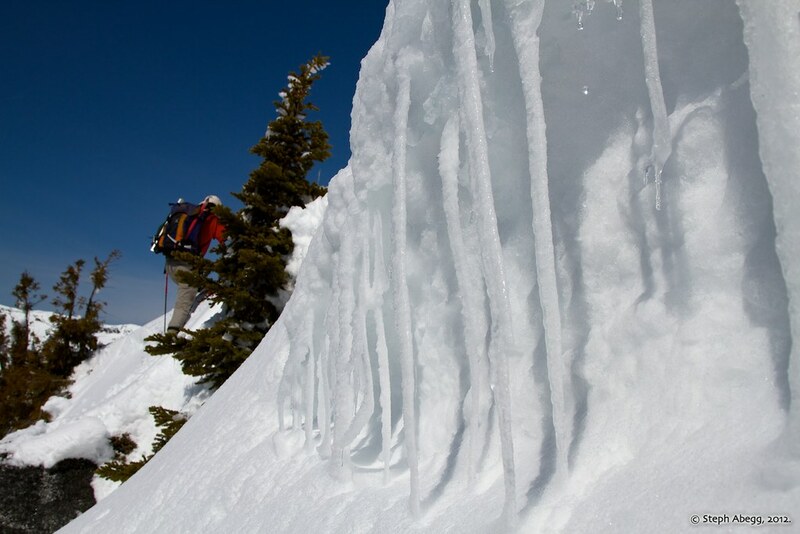 From there, giving a wide berth to the cornices above, we slogged up to a bump in the ridge just east of Davis' summit. We named this corniced little peaklett "Little Davie" so we could feel we had climbed to the top of something (after all, it was still over a mile of vertical gain from the car to get to here). It somewhat made up for the failure to summit Davis that the views from Little Davie were likely better than the views from the actual summit. From here we were treated to up close views of the corniced east side of Davis with the southern Pickets beyond. A little further down the ridge from Little Davie, we could peek down at the towering mile-high NE Face of Davis. 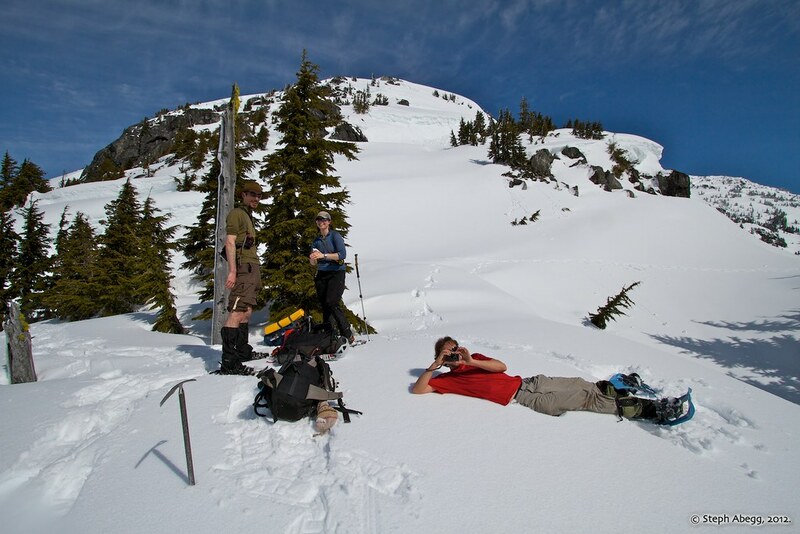 After carefully summiting Little Davie, we enjoyed a relaxing lunch in the spring sun. 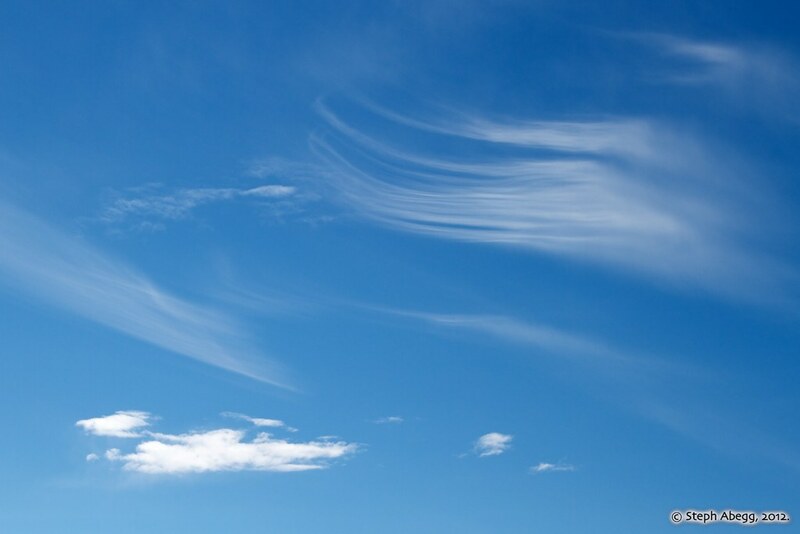 The main attraction was a wispy cloud over Snowfield Peak, which kept changing form like a string fluttering in the wind. By 3pm, we figured we better start the vertical mile of descent, so we started down. A few hours of slushfest, and we were at the car, nearly 12 hours after leaving that morning. 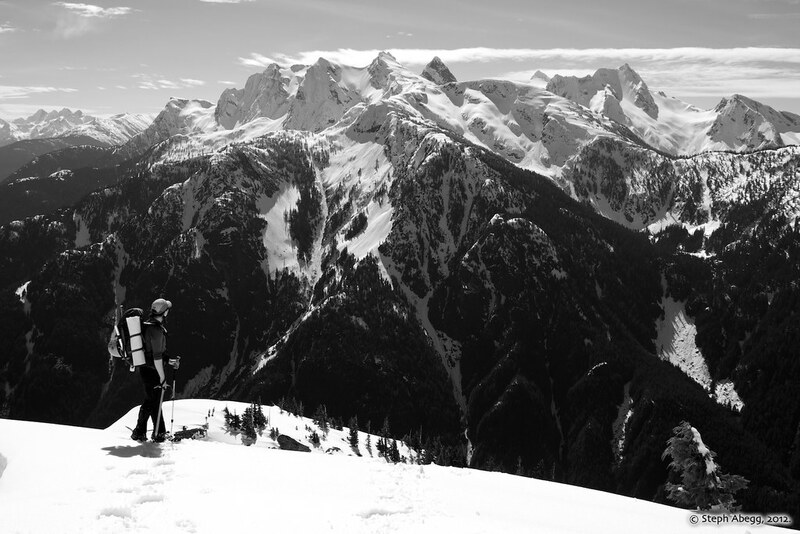 This trip was a great spring adventure in the North Cascades. Even though it is always a tad disappointing not to summit the objective, we were satisfied with our decisions regarding route safety and we still had a marvelous day in the high alpine. Little Davie is a worthy objective in itself, and certainly gets points for its unique and spectacular view. 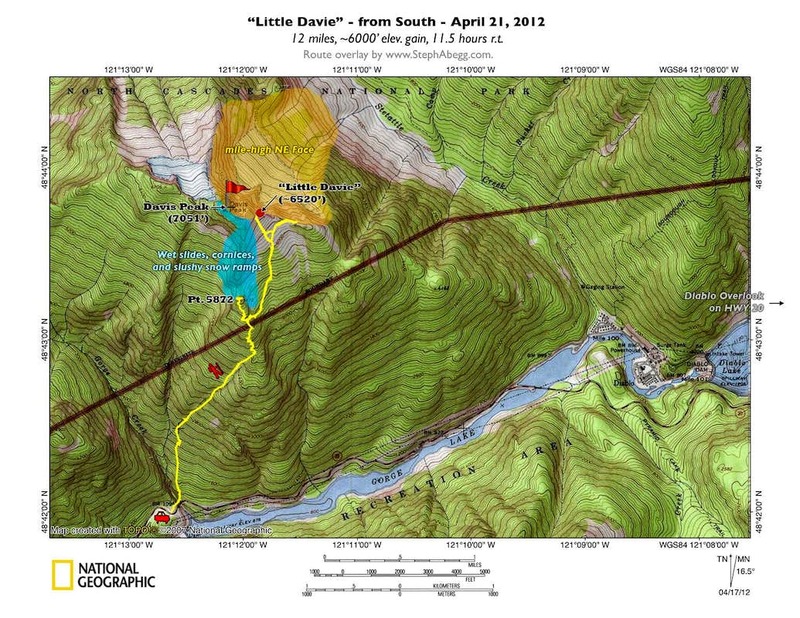 A little more than 0.5 miles south of the summit is a saddle in the ridge, at 5720+ feet. 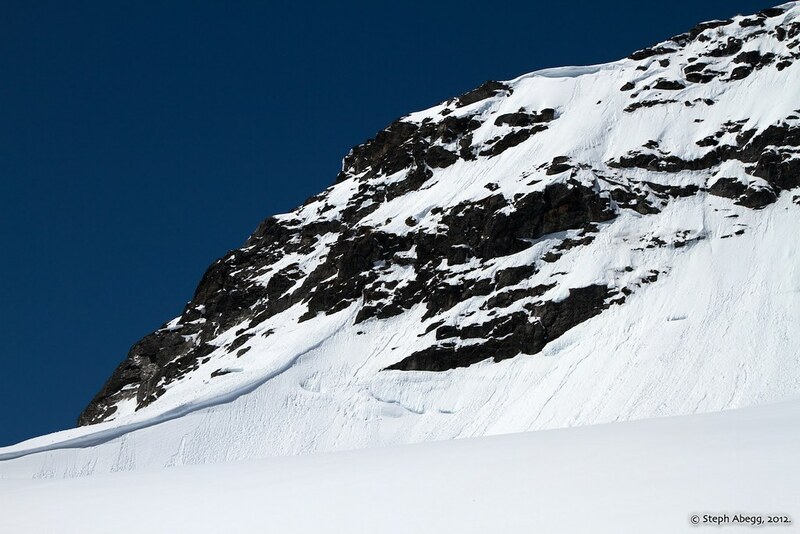 This would be a good place to camp with ready access to the final summit bid. Also, there is a spot lower down, at around 4900', that would be a great camp with views of Colonial Peak, Pyramid Peak, and Snowfield Peak. Starting out from Gorge Creek trailhead. About 45 minutes into the approach, there were some slabs to cross. These were actually pretty easy if you take the time to scope out a feasible route before blindly heading across. 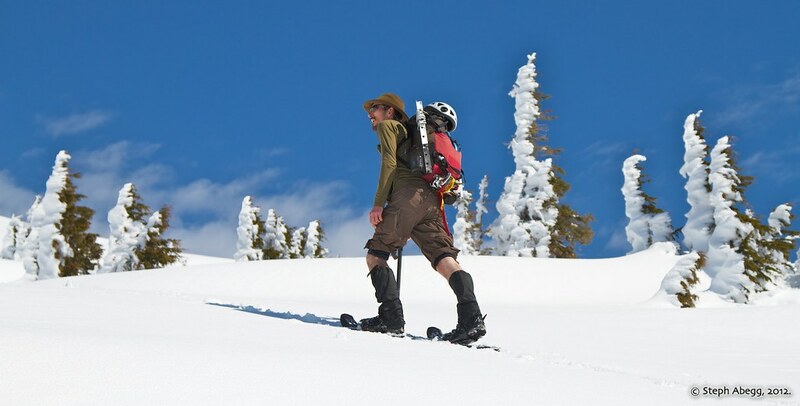 Much of the initial ascent is up steep timbered slopes, which became easier once we hit snow. Above the tree line. From here the route heads up the south ridge shown in this photo. The vista (Colonial, Pyramid, Paul Bunyans Stump, Snowfield, The Haystack). It's impossible not to be distracted by this view. 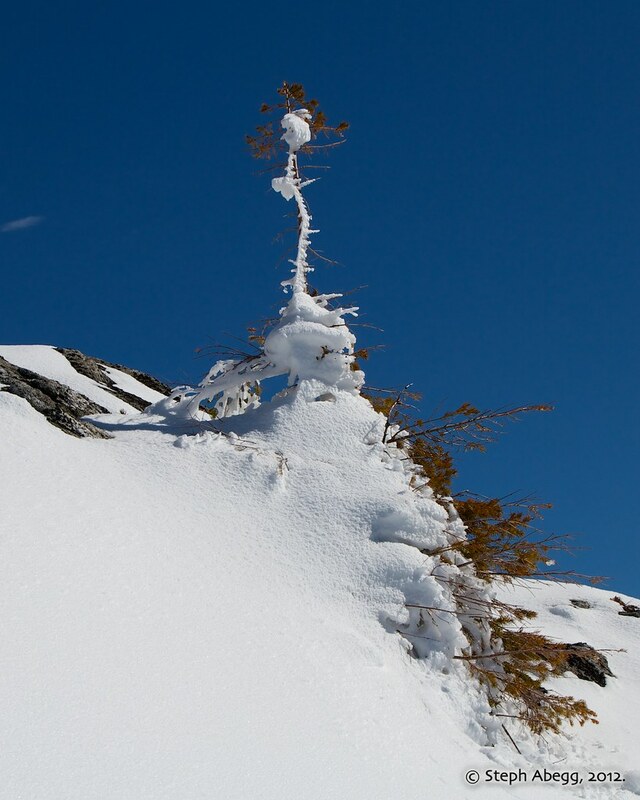 A rimed tree with personality. Gabriel enjoying a flat section of the south ridge. ....then up this. This is the part we had brought our rope and pickets for. 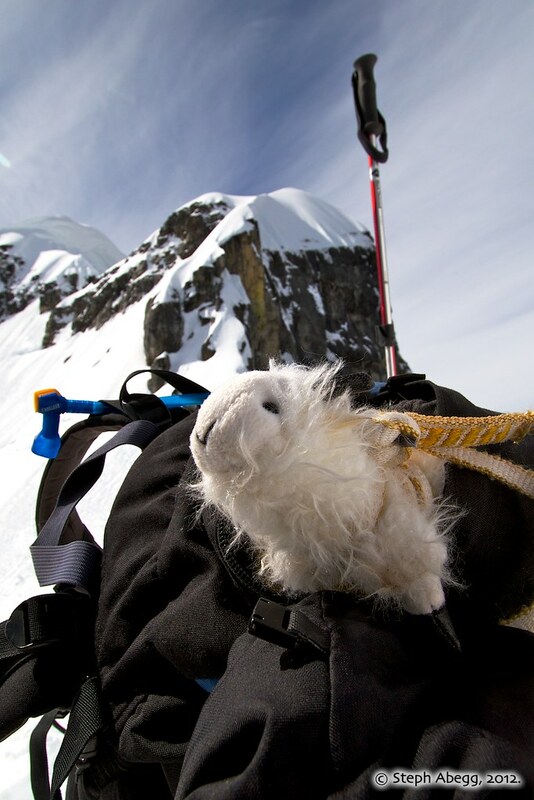 But we felt that the snow conditions were just not good enough for a safe ascent. 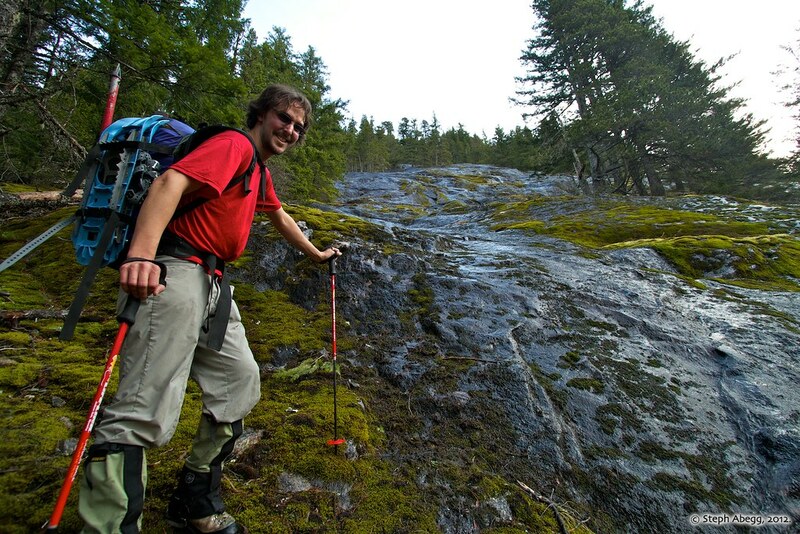 So we decided to descend to the east-side slopes and traverse up to the ridge just east of Davis from there. 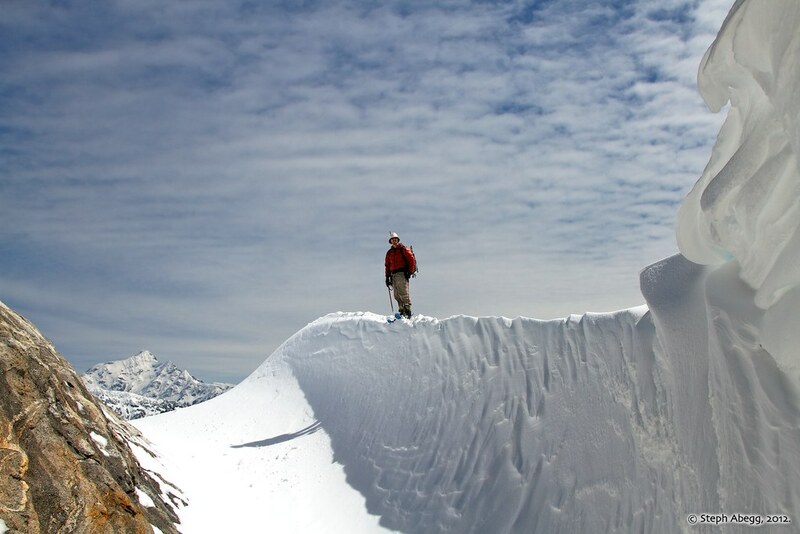 Kevin on the edge of a wind-sculpted snow gully as we scope out a break in the cornices to descend to the east-side slopes. Mt. Ross to the west of Davis. 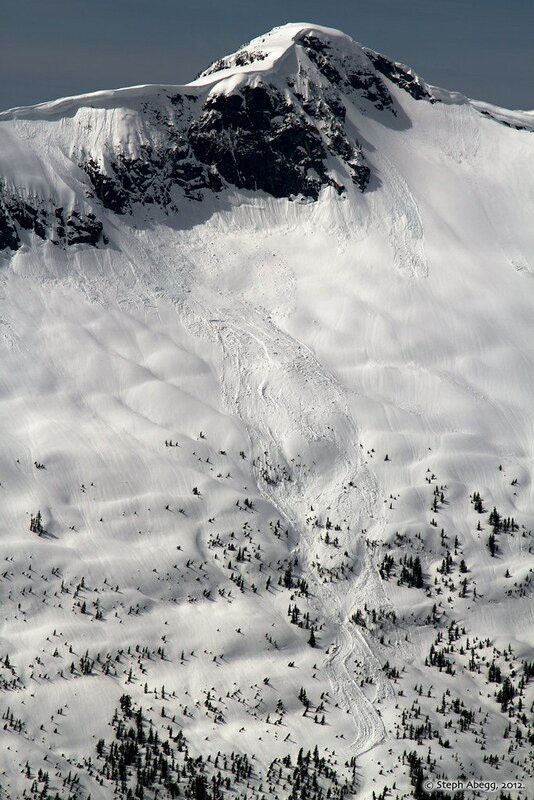 Note the snaking avalanche path down the east slopes. 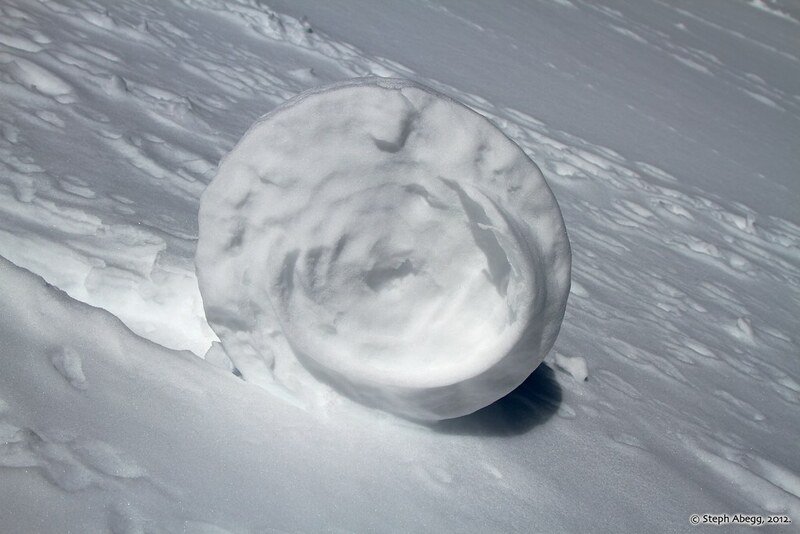 "Snow snail," formed by wet snow rolling down the slope. A "point release" wet slide. 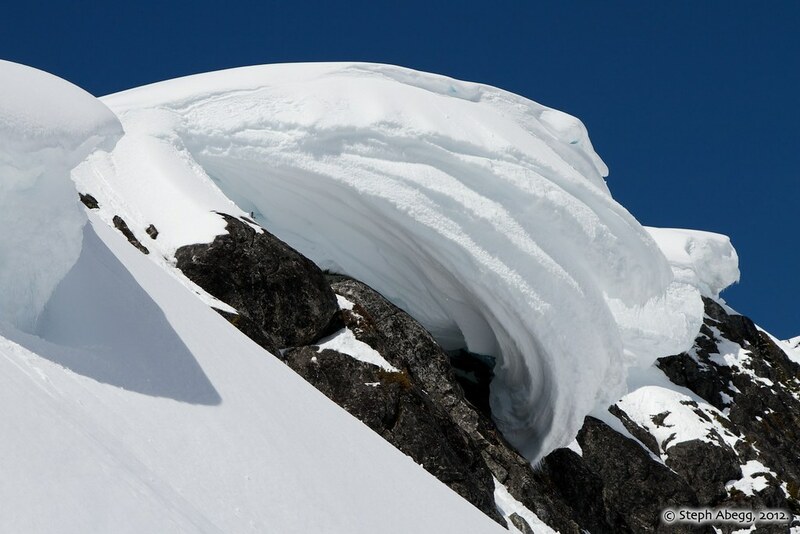 A gigantic cornice on the east side of the south ridge of Davis. We gave these a wide berth when traversing below. Cornices on the east side the south ridge of Davis. The top of "Little Davie". 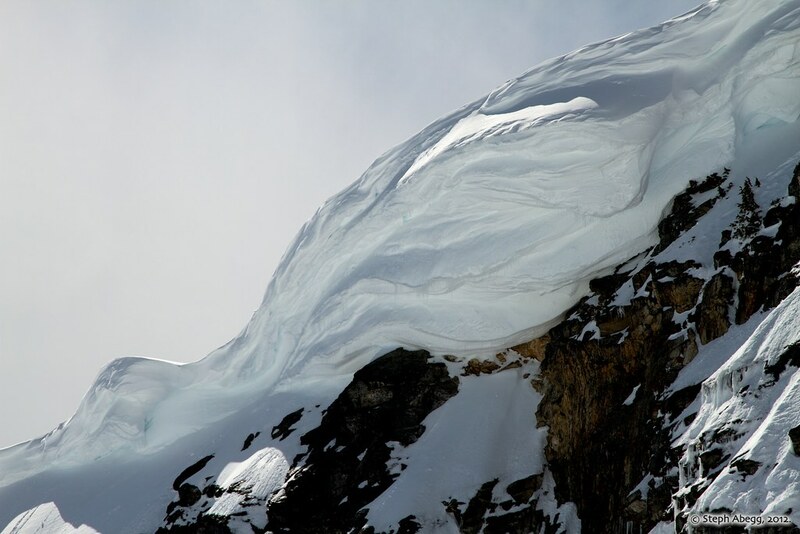 We stayed a bit shy of the true high point due to the cornice which overhangs the towering NE Face. Near the top of "Little Davie". Billy came along too. This time he didn't get nearly so wet as last time. View of Davis from Little Davie. Note the towering NE Face and views of the southern Pickets beyond. Lindsay and Kevin on "Little Davie". View from further along the ridge east of Davis and "Little Davie." 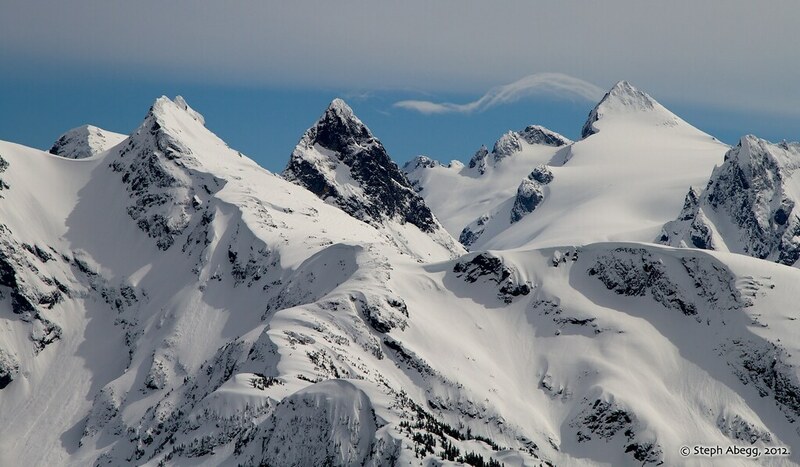 Wispy cloud over Snowfield Peak, #1. 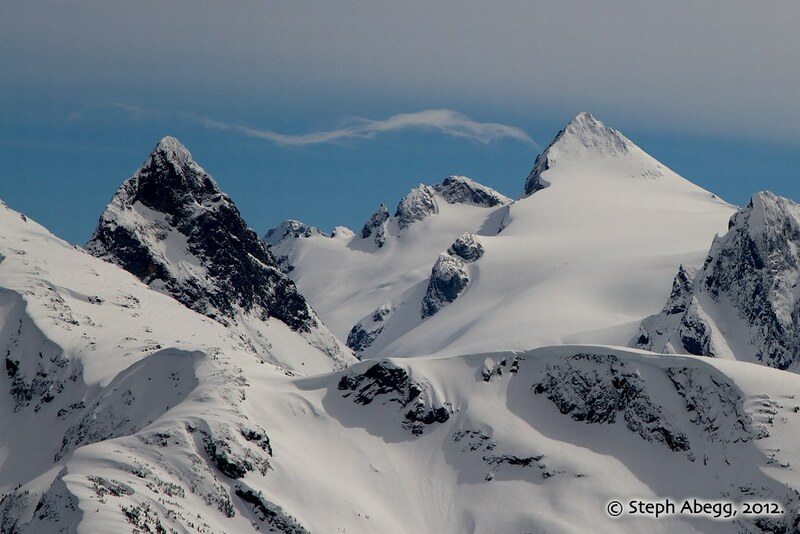 Wispy cloud over Snowfield Peak, #2. 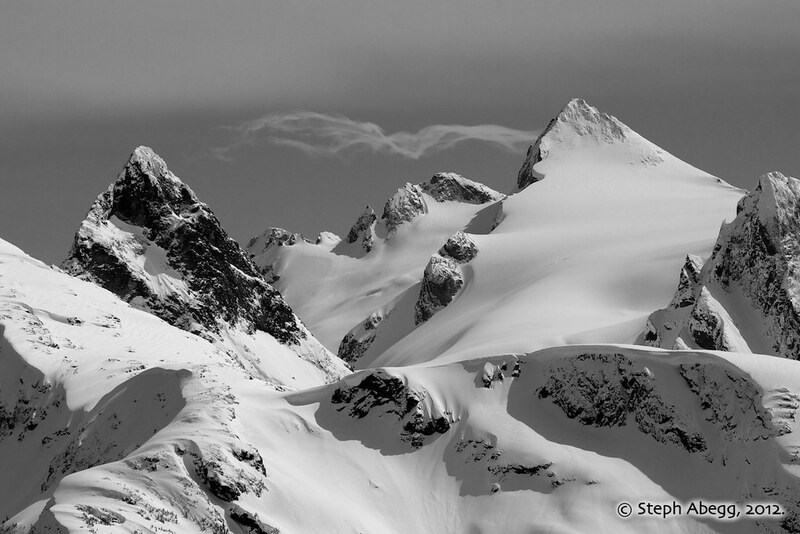 Wispy cloud over Snowfield Peak, #3. 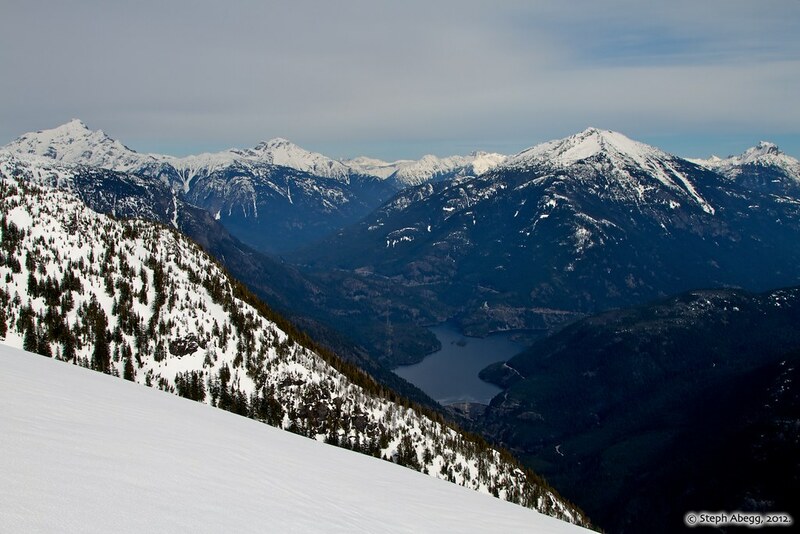 View of Diablo Lake from the south side of Davis Peak. You can make out the Diablo Overlook at the far end of the lake, which is where the photo at the beginning of this page was taken.